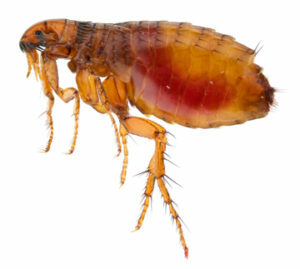 Adult fleas feed on blood with their piercing and sucking mouthparts. They typically seek a blood meal within two days of becoming an adult. Cat and dog fleas prefer these two animals, but readily feed on other animals (i.e. raccoons, rats and even humans). Effective flea control requires the customer’s cooperation and involves three major steps: on-animal flea control, sanitation and insecticide application. The house should be thoroughly vacuumed to remove larvae, pupae and food materials. The vacuum cleaner bag should be sealed and discarded immediately after vacuuming, and pet bedding should be discarded or washed in hot, soapy water. The pet should be treated (not by the exterminator or by using insecticides) on the same day that a residual insecticide treatment is being done at the home. Using over the counter products will often cause the fleas to scatter and make effectively eradication of the fleas more difficult to achieve. 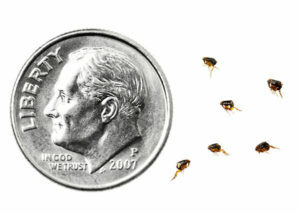 A professionally trained and licensed exterminator should be used.